MegaCryptoPolis city builder strategy game had generated more than $1 Million on preorder stage and has finally launched to become one of the most popular dApp and Top 1 place in Games category by volume (as reported by Cointelegraph’s dAppList* and dAppRadar**). Commencing on 21st May 2018 players were acquiring blocks of land, game itself actually launched after couple of delays on 10 October players started to construct buildings to compete for influence on decentralized city map. That resulted in total turnover of 1500 ETH during the first two weeks making one third of Ethereum network mining powers busy with game operations for 5 days (Top 1 gas burner as reported by EtherGasStation***). One of the most noticeable functions of the game are districts those should be obtained by players to open their land plots for others. During the preorder stage districts were sold on auctions for prices exceeding 20 ETH, however some districts had generated up to 30 ETH income even before the actual game launch. There are only 5 districts left those ownership rights can be acquired by participation in an auction. 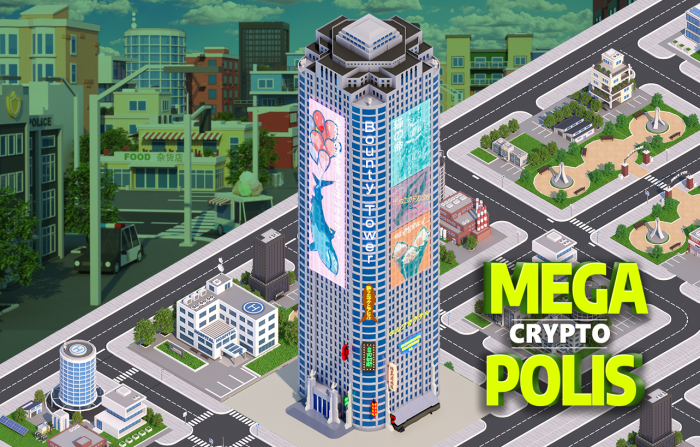 MegaCryptoPolis introduced simple yet functional mix of user-friendly HTML5 client and Ethereum digital wallets those allowed for running a graphically-rich game inside any browser or mobile device with secure ownership of all game assets by players. Developers only host the game GUI (graphic user interface) client with all the logic is running on Ethereum blockchain smart contracts. All the game assets (like buildings and plots of land) are ERC-721 tokens those can be transferred or traded freely by players. As no centralized database is controlled by a single party, there is no way developers can influence the game process or change game math or formulas. That creates a major challenge for traditional game developers those are not ready to pass game assets ownership rights to their players. Blockchain gaming industry is evolving really fast and it’s certainly hard to predict how huge that may be after the mass-adoption of crypto currencies actually happens.